The second Woody Allen movie in which he does not appear, this saddening yet ultimately hopeful nostalgia piece concerns a poor waitress, Cecilia (Mia Farrow), who is stuck in a marriage to an unfaithful, abusive lout (Danny Aiello), and whose sole means of escape is the movies. One particular movie — The Purple Rose of Cairo, a high-society piffle of the genre that was popular at the time (the ’30s) — really goes over with Cecilia, who goes back to see it several times. 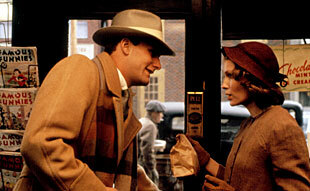 Eventually, a pith-helmeted adventurer and supporting character in the film, Tom Baxter (Jeff Daniels), notices Cecilia’s devotion and steps down off the screen to be with her. Tom’s fellow movie characters are stranded on the screen, unable to continue the story without him (they are reduced to sitting around bitching about the situation — this may be Allen’s comment on stars who think they can wing it without a script and downgrade the importance of the screenwriter). Cecilia, giddy and flattered that her movie dream date has come to her, is nonetheless a practical woman who knows full well that Tom isn’t real. The joke expands when Gil Shepherd (also Daniels), the Hollywood star who played Tom, enters the picture and also falls in love with Cecilia. Daniels, as the rather more flawed Gil, still manages to invest him with the sweetness we see in Tom — Gil’s egotism is almost bashful, and his angst over being considered “minor” is played for affectionate laughs. A lot of meanings float around in this outwardly simple fable, and some viewers misread the ending as a downer — they wanted Allen’s film to have the rhapsodic, idealized ending of an old-Hollywood romance; put bluntly, they wanted her to end up with either of the two Jeff Daniels characters. But the movie is about Cecilia, whose character arc shows that losing oneself in fantasy can be temporarily satisfying but disastrous in the long run. By the end, we feel that she is stronger and smarter; she will look to herself for escape, not to the movies. To have ended the picture with Tom or Gil sweeping Cecilia up and whisking her away from her problems would have rendered the movie pointless. This may be Allen’s least recognized feminist parable (and far more successful than his later Alice). This entry was posted on May 2, 1985 at 11:46 pm and is filed under tspdt. You can subscribe via RSS 2.0 feed to this post's comments. You can comment below, or link to this permanent URL from your own site.